Ubud is a very unique and cultural part of Bali; a quirky town full of shops, restaurants and spa’s, surrounded by beautiful rice fields. 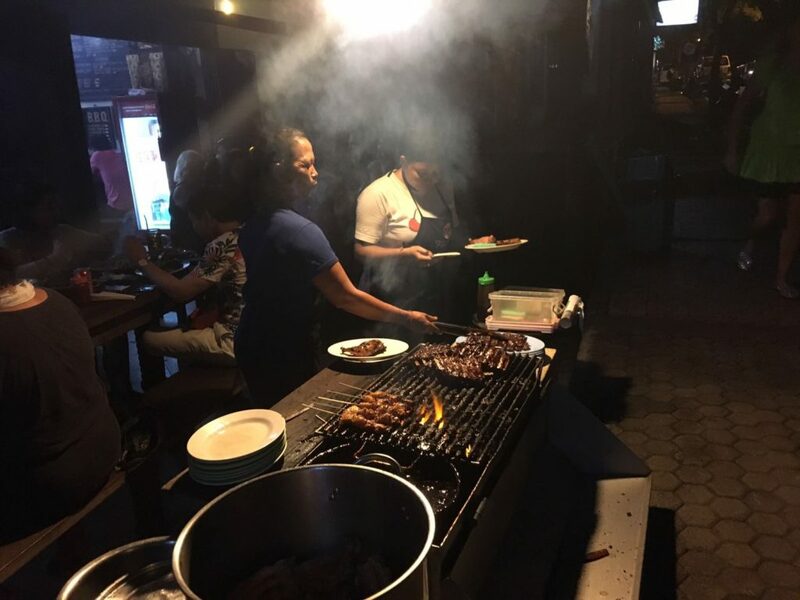 It’s located in the centre of Bali and takes about an hour and a half from Denpasar airport, but is definitely worth a visit. 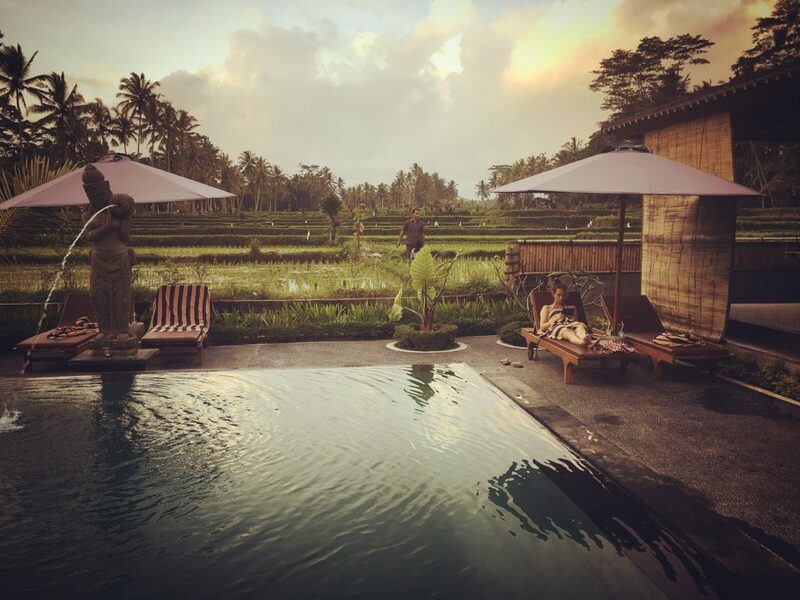 Some of the people we’ve met around Bali have suggested that “all you need is a day ‘to do’ Ubud” but we would probably argue that there’s actually quite a bit to see and do in Ubud and the surrounding area! 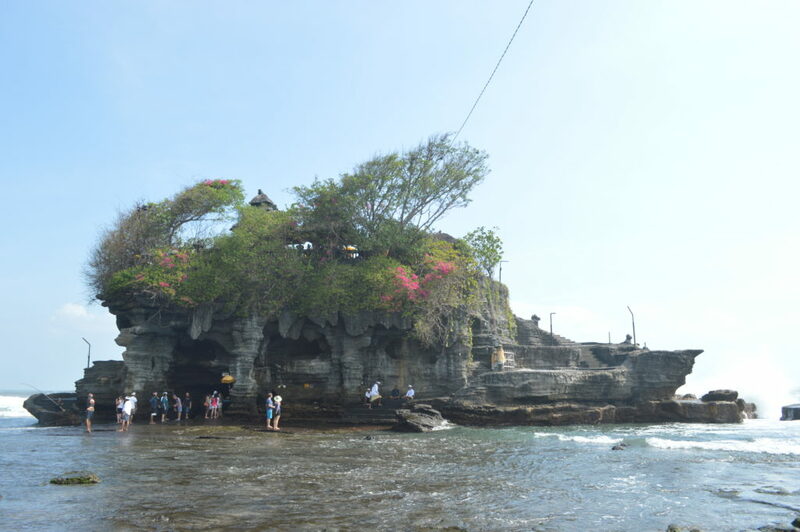 It’s central location also makes it a great base for some of the most popular excursions in Bali. 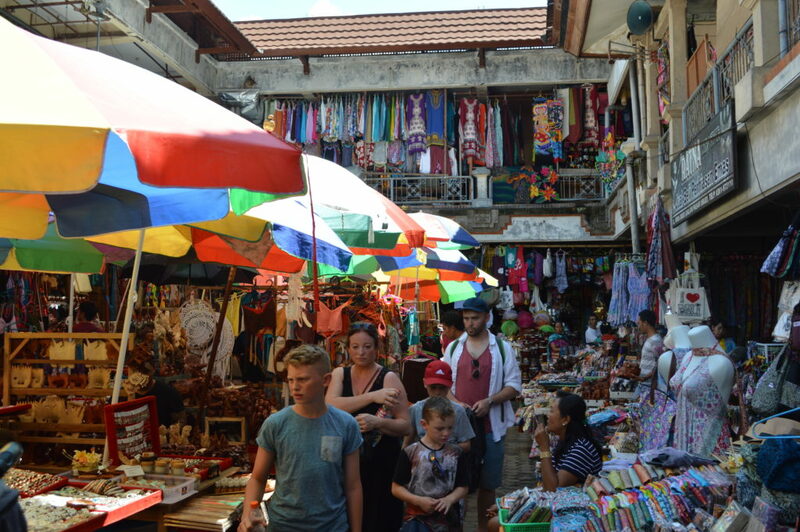 The town centre itself is very busy and there are a lot of tacky touristy shops (including the market – and especially down the roads towards monkey forest), however there are also some lovely local shops as you travel more into the heart of the town. 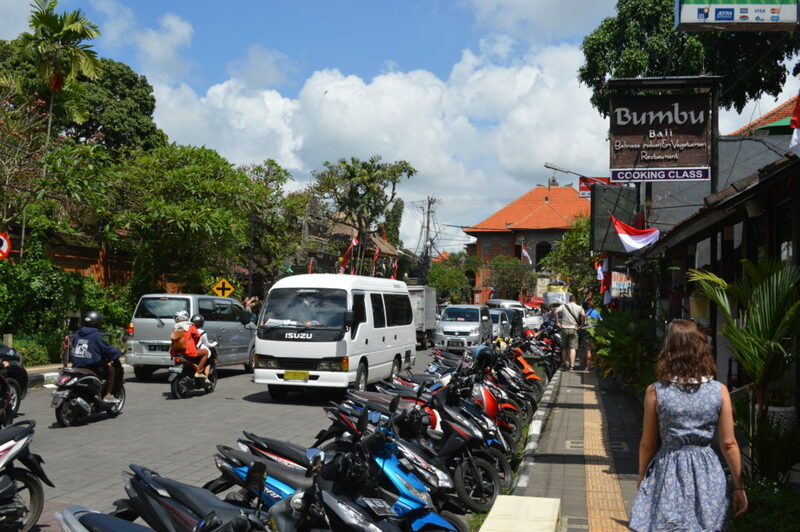 Although Ubud is very busy in the tourist-y areas, there are some beautiful tranquil spots all over the town. Tasku spa is one of our favourite spots to take a quick break in Ubud. 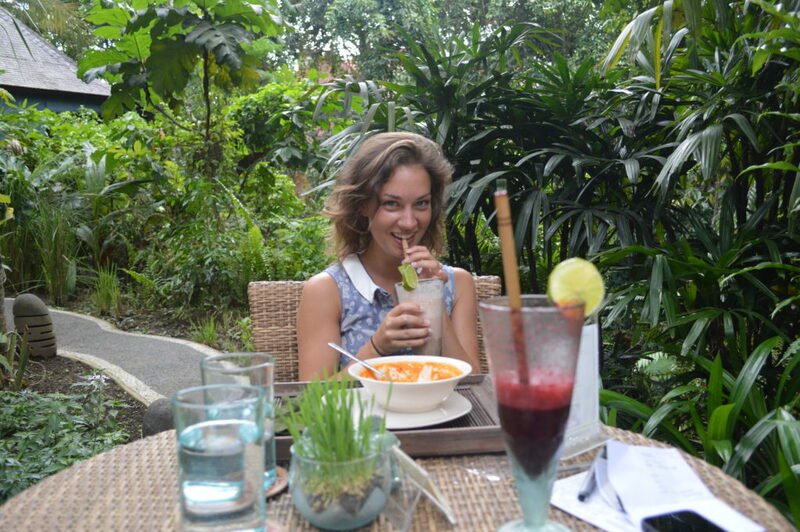 It is super expensive for a Balinese spa, however they do have a lovely garden area and serve amazing smoothies and soups, so great for a cheaper lunch option. 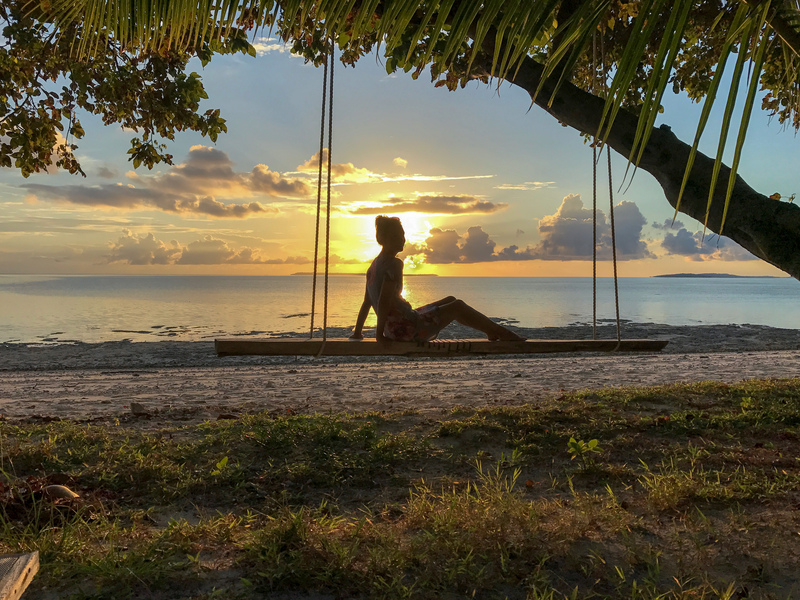 We went for treatments at Sang Spa instead – much more competitive prices at around £10 for an hour and a half “holistic combination massage”. I paid £15 for a 2h body massage and scrub… it was a pretty horrific experience! After not really understanding the woman’s accent, I ended up with body scrub and warm (smelly) yoghurt all over my underwear! 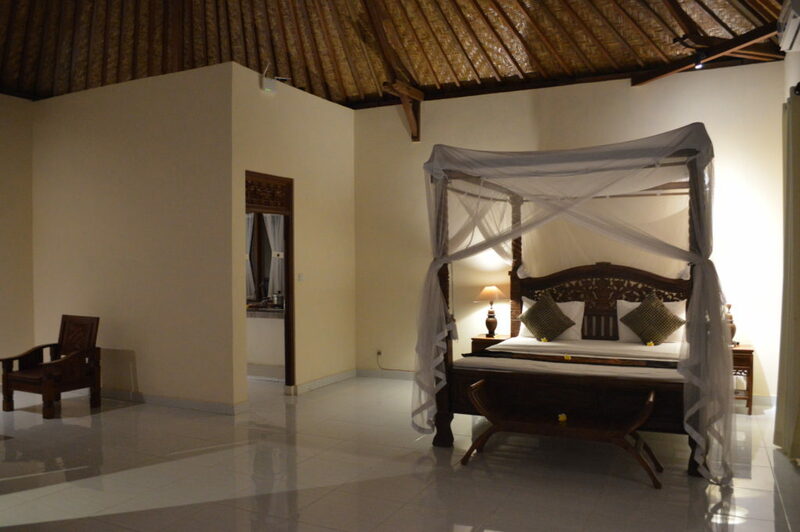 If planning a spa trip in Ubud, booking in advance is an absolutely essential. We spent around a hour wandering around asking different spas if they had any space and pretty much all the highly rated ones were full! 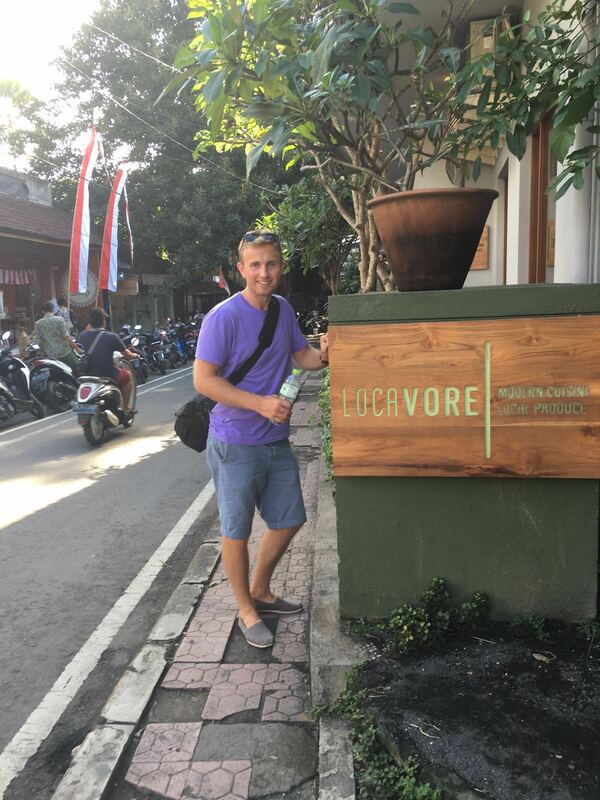 There are loads of places to eat in Ubud and we enjoyed visiting a few different restaurants (varying in price)! 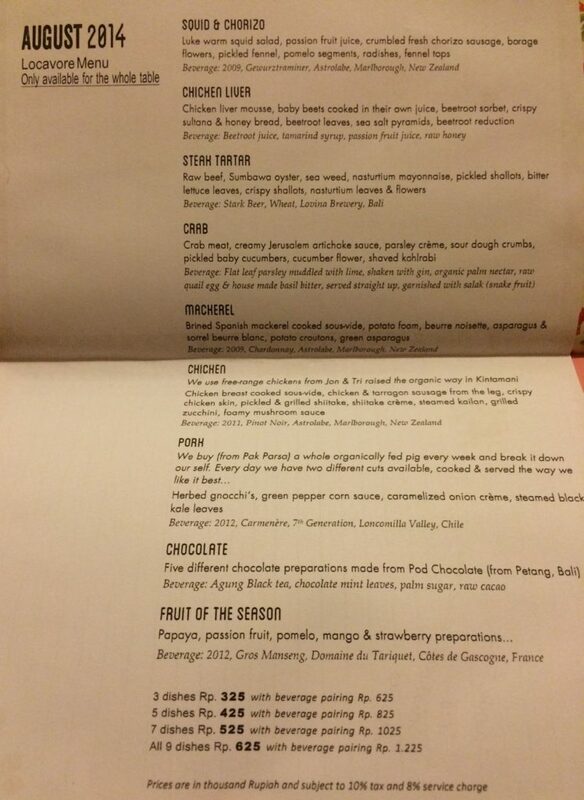 In 2013, we splashed out and paid a visit to Locavore. 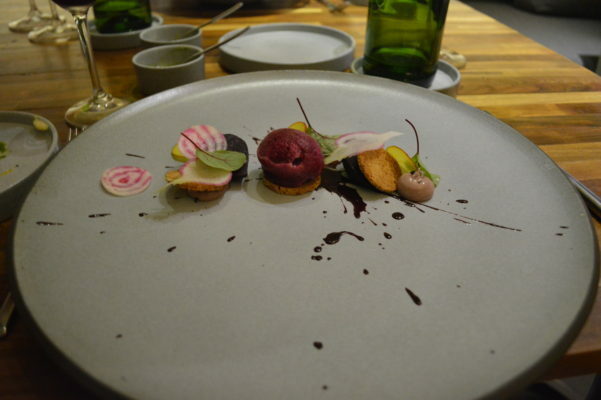 We went for a 7 course tasting menu with wine pairings and the food was exquisite. We particularly enjoyed the 5 different chocolate desserts! 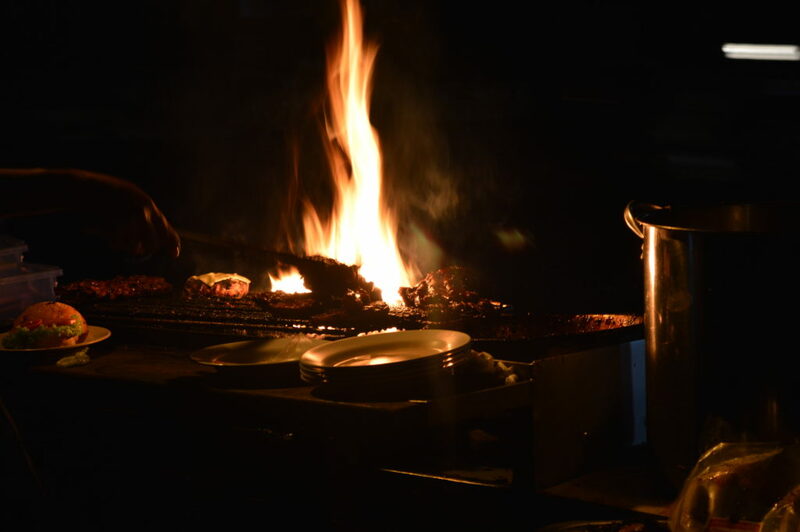 On the other end of the spectrum… one of our favourite spots in Ubud is Naughty Nuris Warung. Famous for BBQ ribs and lethal mojitos! It is a little way out of town but really popular and authentic (Est. 1995). BBQ ribs at Naughty Nuri’s! 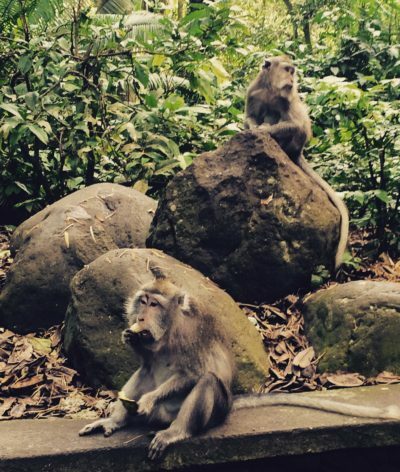 It is hard to believe that I have gotten this far into the post without mentioning some of the most popular things to do in Ubud – checking out the Padi rice fields and of course visiting the famous monkey forest!! 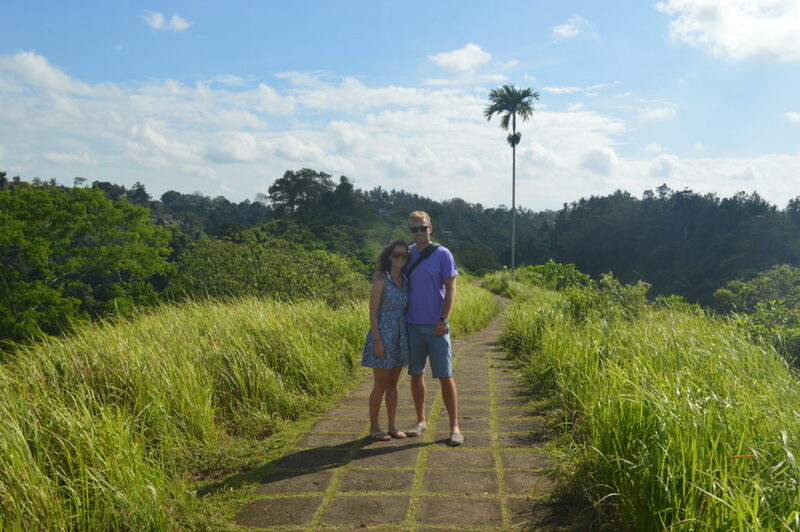 Campuhan ridge walk is a 20minute scenic walk just outside Ubud centre. 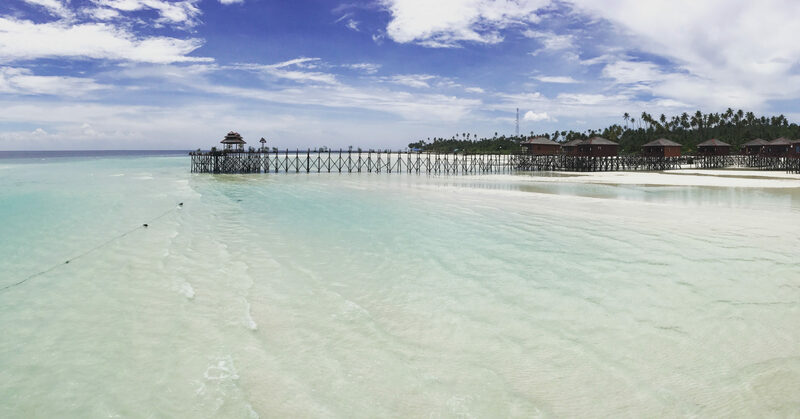 It never seems too busy and has beautiful views of the jungle and rice fields. You can read more about it here. Monkey forest is one of the most common places to go in Ubud and if I wasn’t absolutely petrified of monkeys, it would’ve been really good! The monkeys all stay in the forest because they basically have an endless supply of tourists feeding them bananas! It only cost 400,000idr to enter the “forest” and the place is enchanting with a temple in the middle. It reminded me of King Louis’ temple in The Jungle Book! The monkeys are pretty outrageous though and anything held lose in your hand is at risk of being snatched – we lost a water bottle! I only risked taking one photo and we only lasted about 15 minutes before it all became a bit much for me! 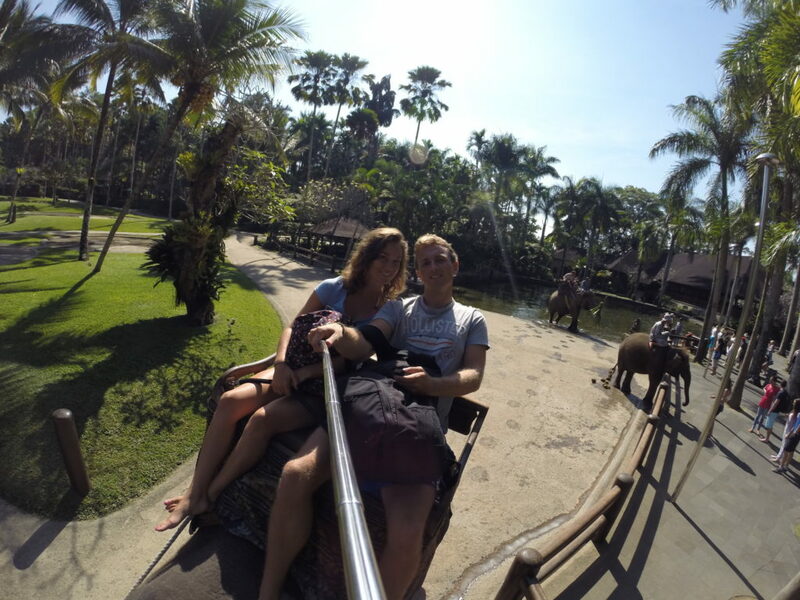 In 2014, we thought it would be our “once-in-a-lifetime” visit to Bali so at the end of our trip, we splashed out and went white-water rafting and visiting the Elephants with Bali Adventure Tours. 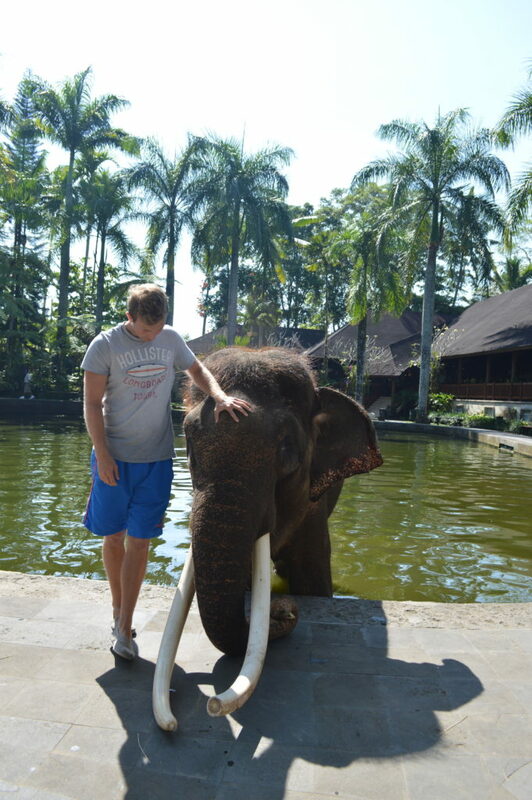 Ubud is a great location for this day trip and although it was an early start to “bathe and breakfast” with the elephants – this part of the day was a bit more special than just riding the elephants though. We LOVED white-water rafting along the river Ayung and got some great GoPro footage! 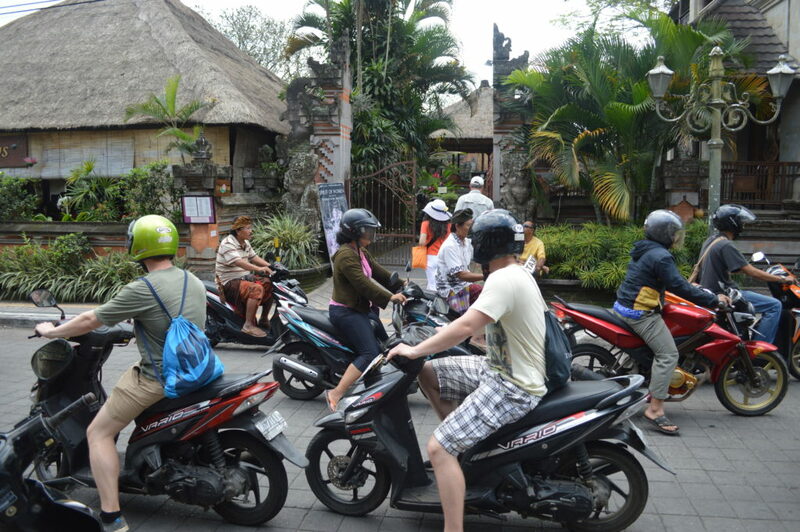 You can read more about our day out with Bali Adventure Tours here. View down to the river Ayung – spot the white-water rafting boats! Alongside offering lots of pre-organised tours, lots of touts will also be willing to help you plan a private personal tour. 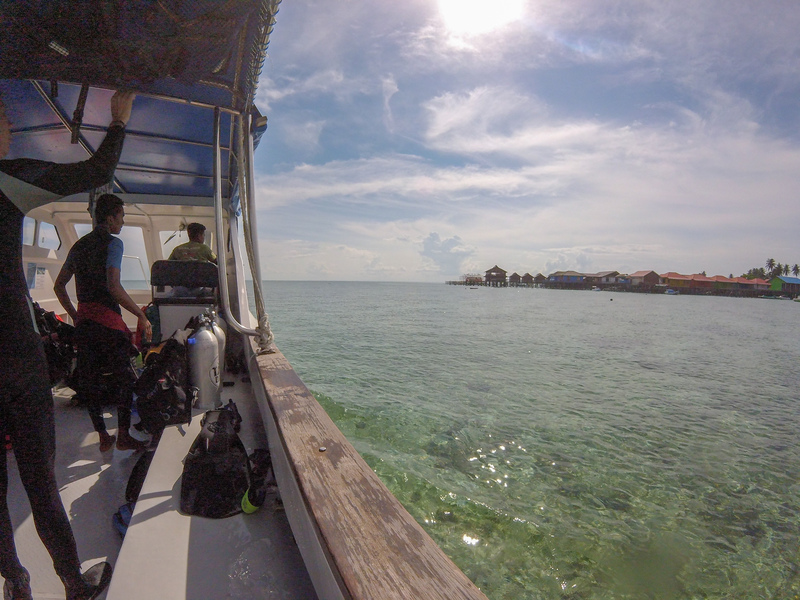 We were travelling back to Denpasar airport and decided to have a bit of a tour on the way back to fill the day! One of the best decisions we made. 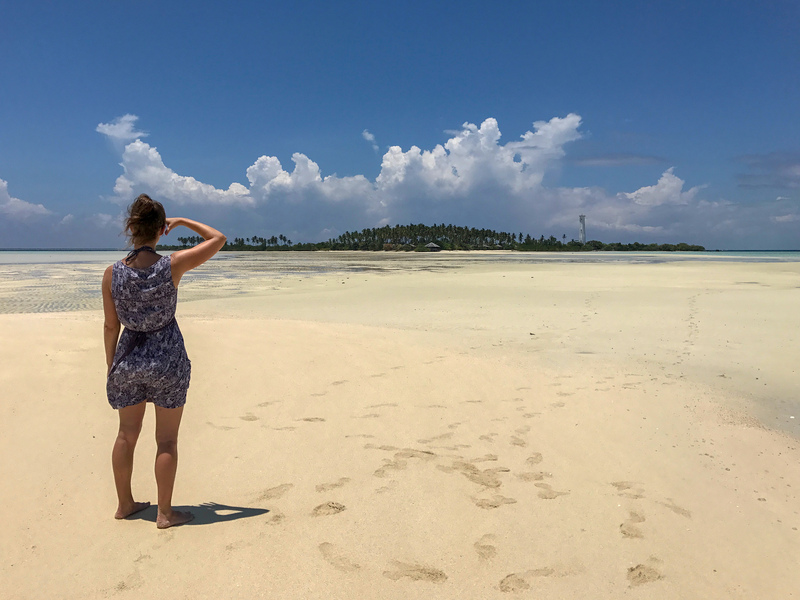 We went to places we definitely wouldn’t have been to and were really grateful for the guides recommendations. Our first stop was the Tegalalang Rice Terrace – wouldn’t necessarily do an isolated visit here as there are other rice fields all around Ubud. However it was beautiful and only 5,000idr to drive through. On our way, the driver suggested visiting a Coffee plantation; Bali Pulina. 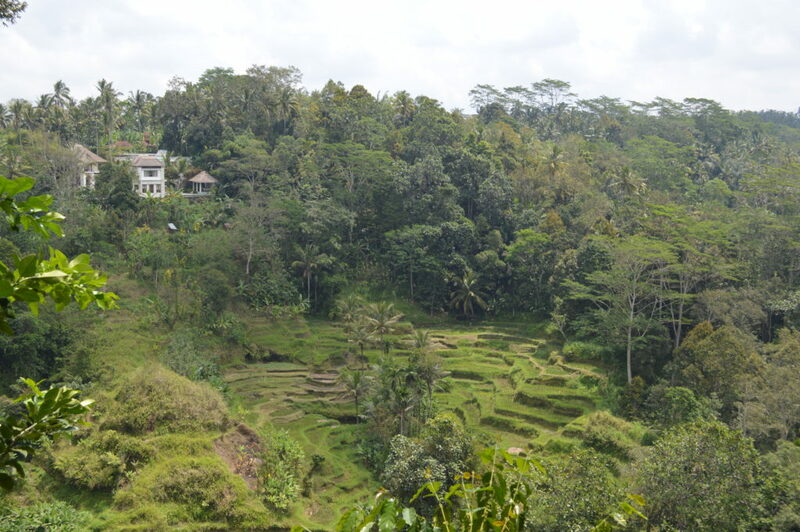 It had just as good views of the rice fields as the Tegalalang rice terrace and we loved it! 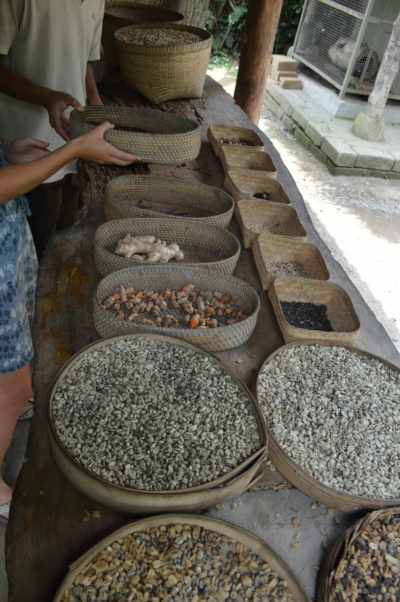 The tour was really informative and we saw the famous Luwaks; a small animal (asian palm civet) that produces the most expensive coffee in the world! They eat and digest the coffee cherries and their excrement is used to make coffee – we even tried some ($5) and bought a jar for our Dad’s … they hated it! 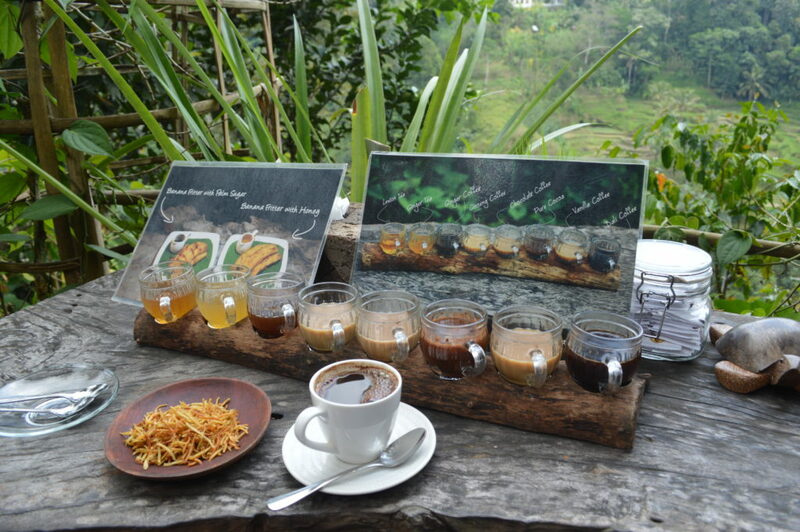 We were given a free taster tray of all different type of coffees and some teas. I don’t normally like coffee but did enjoy the vanilla coffee, chocolate coffee and lemon tea. I still can’t believe we didn’t have to pay anything to visit the plantation – it’s a fantastic place to spend an hour with lots to see (and taste!) with great views of the padi rice fields. 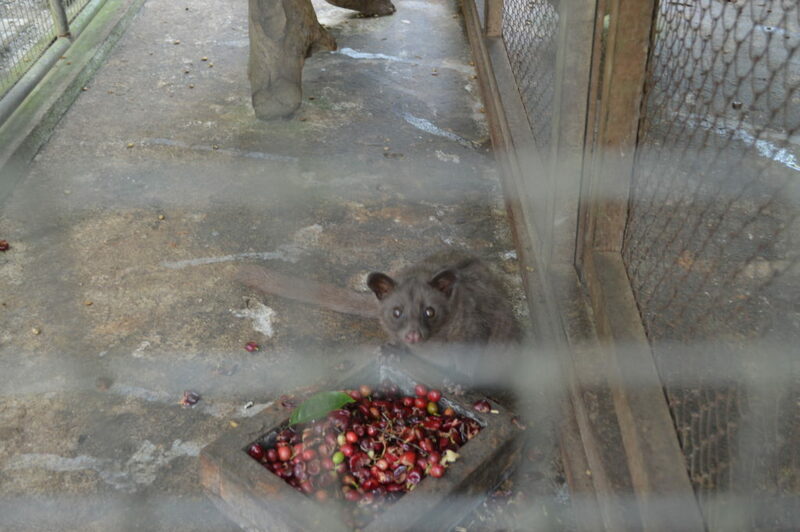 Luwak with his coffee cherries! 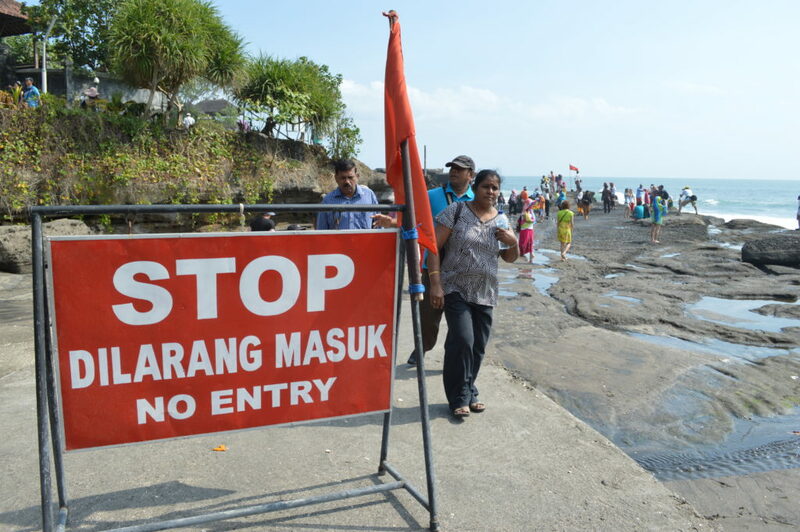 Before heading to the airport, we made one more stop at Tanah Lot; a temple on the West Coast of Bali. 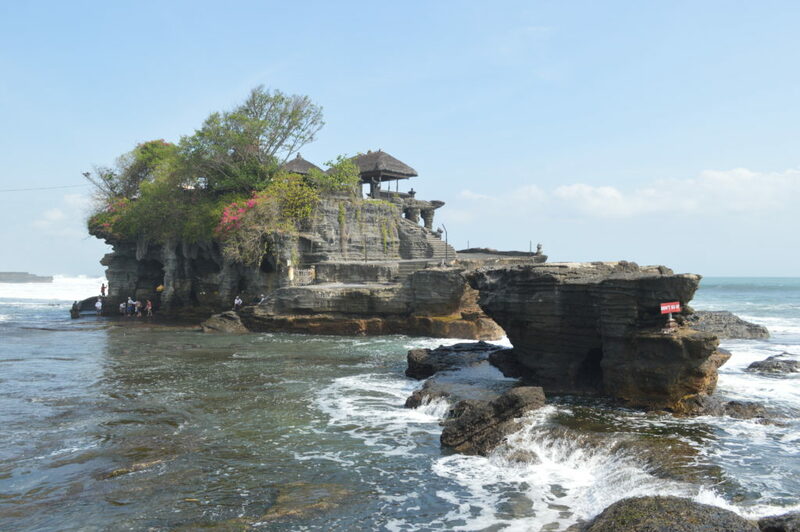 At certain tides, the temple is completely surrounded by the sea. There are warning signs as the waves are pretty big around this area… but as you can see these are very much ignored! It is a bit of a tourist trap and didn’t cost much only 30,000idr each to walk down to the temple but should’ve probably been free! It was a bit underwhelming to be honest but still a cool sight. Ubud is overly saturated with places to stay and it can feel a bit overwhelming looking into so many different options. 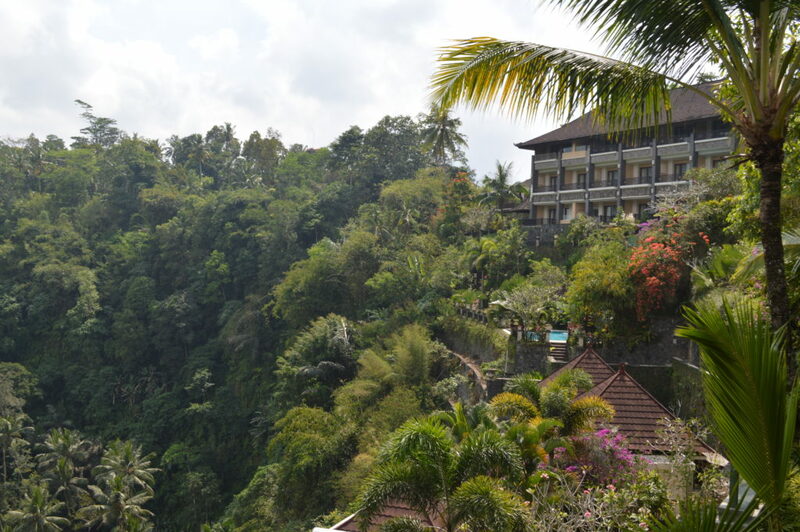 In 2014, we stayed in Ayung Hotel; a luxury rainforest hotel situated alongside the river Ayung. We got a great price (around £80 pn) and although it wasn’t necessarily our usual taste in decor (lots of marble statues), the breakfast and scenery was fantastic. 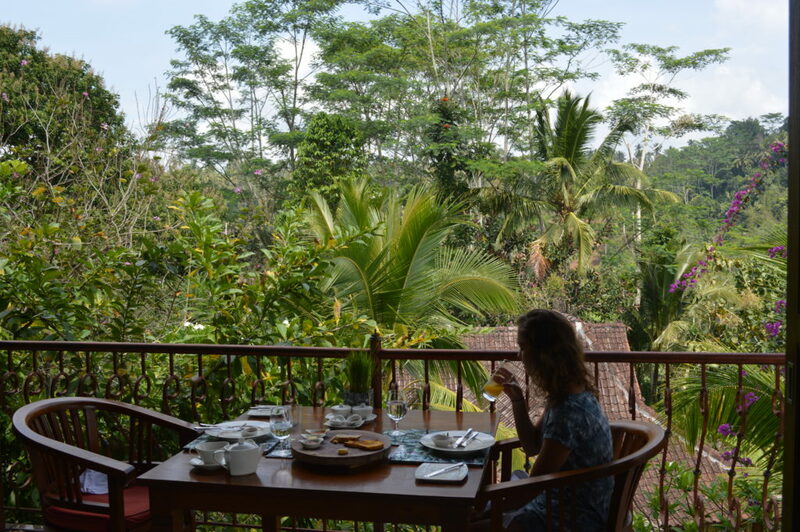 We could get free shuttles into Ubud centre at set times throughout the day and the food was very luxurious. In 2016, we couldn’t find such a good luxury deal so found somewhere more cultural with good reviews. Staying at Pajar house was a fantastic experience. We basically had our own house for £30pn with shuttles to town on request and breakfast delivered to our door every morning. At a fraction of the price we paid before, we couldn’t believe what a good deal we were getting! 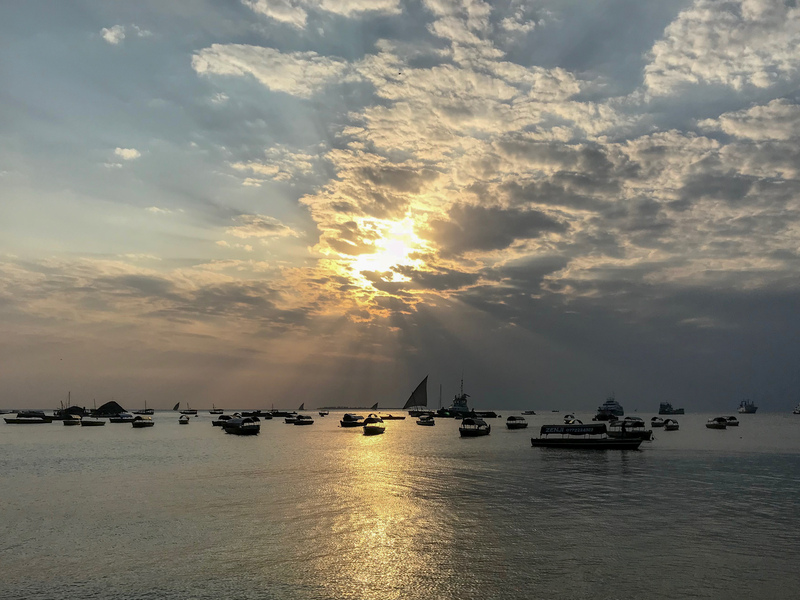 The only bad aspect was sleep quality… but apparently dogs howling throughout the night and cockerels crying at all hours is just a true Balinese experience! We also had a wonderful swimming pool just a short motorbike ride away situated amongst the padi rice fields!